You can save your work at anytime while analyzing or interacting with data in Tableau. Automatically save a workbook - Automatically saves the workbook in the same location as the original file. In the event of a crash, a recovered version is available. Save a workbook – Saves all open worksheets. Save a packaged workbook – Saves the workbook along with all referenced local file data sources and images into a single file. Save a bookmark – Saves the current worksheet. You can share workbooks and bookmarks with your co-workers, provided they can access the relevant data sources that the workbook uses. If your co-workers do not have access to the data sources, you can save a packaged workbook. Custom fields such as binned measures, calculated fields, groups, and sets are saved with workbooks and bookmarks. Tableau Desktop automatically saves your work for you every few minutes - no more losing hours of work if Tableau Desktop closes unexpectedly. This feature is enabled by default, but you can turn it off from the toolbar under Help >Settings and Performance>Enable Autosave. Note: If you don't see this option, your System Administrator may have disabled this feature. If Tableau crashes, a recovered version of the workbook is automatically created with a .twbr extension and saved in the same location as the original file or in your My Tableau Repository/Workbooks folder. New workbooks are saved with the name "Book1" plus a numeric ID. 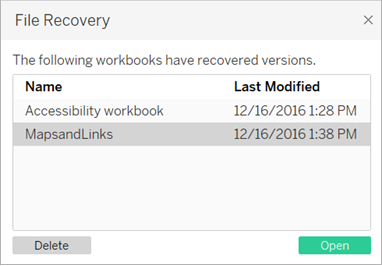 When you reopen Tableau, a recovery dialog box shows a list of the recovered files that you can select and open to continue in your flow. You can also delete unwanted files from this same dialog box. For more information about how to turn this feature on or off during installation, see Before You Install in the Tableau Desktop Deployment guide. When you open Tableau Desktop, it automatically creates a new workbook. Workbooks hold the work you create and consist of one or more worksheets. Each worksheet contains a particular view of your data. Specify the workbook file name in the Save As dialog box. By default, Tableau saves the file with the .twb extension. By default, Tableau saves your workbook in the Workbooks folder in your My Tableau Repository. You can find this repository in your Documents folder. However, you can save Tableau workbooks to any directory you choose. Tableau file names cannot include any of the following characters: forward slash (/), backslash (\), greater-than sign (>), less-than sign (<), asterisk (*), question mark (? ), quotation mark ("), pipe symbol (|), colon (:), or semicolon (;). Select File > Save As and save the file with a new name. Packaged workbooks contain the workbook along with a copy of any local file data sources and background images. The workbook is no longer linked to the original data sources and images. These workbooks are saved with a .twbx file extension. Other users can open the packaged workbook using Tableau Desktop or Tableau Reader, and do not need access to the data sources that the workbook includes. To learn more about how to save your workbook as a packaged workbook, see Packaged Workbooks. You can save a single worksheet as a Tableau bookmark. When you save the bookmark, Tableau creates a snapshot of the worksheet. Bookmarks can be accessed from any workbook using the Bookmarks menu. When you open a bookmarked worksheet, it adds the worksheet to your workbook in the state that it was in when it was bookmarked. It will never update or change automatically. Bookmarks are convenient when you have worksheets that you use frequently. Select Window > Bookmark > Create Bookmark. Specify the bookmark file name and location in the Create Bookmark dialog box. Tableau saves the file with a .tbm extension. The default location is the Bookmarks folder in the Tableau Repository. However, you can save bookmarks to any location you choose. Bookmarks that are not stored in the Tableau repository do not appear on the Bookmark menu. You can organize bookmarks into folders in the same way you organize files or documents. This can be useful when you have a large number of bookmarks to manage. For example, you might organize bookmarks based on employee name, product types, or sales results. You can organize bookmarks by creating a new folder, renaming an existing folder, renaming existing bookmark files, and so on. Delete bookmarks the same way you would delete any other file on your computer. After you delete a bookmark from the Bookmarks folder in the Tableau Repository, it is removed from the Bookmarks menu the next time you start Tableau. Note: While bookmarks are generally a snapshot of the worksheet and include the data connection, formatting, etc., a bookmark does not include parameter values and the current page setting on the Pages shelf. Save a workbook - saves a workbook in the project you specify. Save a copy of a workbook - saves a copy of the workbook in the project you specify. Save changes as a custom view - saves changes as a custom view, which is related to the original view and updates when the original view is updated. When you create a new workbook, or edit an existing workbook on Tableau Server or Tableau Online, you can save your work at any time. In web editing mode, select File > Save. Note: If the workbook has never been saved, you must select File > Save As. Sometimes you don't want to overwrite an existing view with your changes. In cases like these, you can save a copy of an existing workbook. When you do this, the existing workbook remains unchanged, and a copy of it is created for you to edit as you wish. In web editing mode, select File > Save As. For Name: Enter a name for the workbook. For Project: Select the project in which you would like to save the workbook. (Optional) Select Show sheets as tabs to display all worksheets, dashboards, and stories in the workbook as separate tabs. Note: The person who published the data source to Tableau Server or Tableau Online may have also set up credentials for accessing the published data source included in the workbook you are about to save. These authentication options should appear in the Save Workbook dialog box. For more information, see the authentication types in the Set Credentials for Accessing Your Published Data topic. If you notice you are making the same changes to a view every time you open it, you might want to consider saving the changes as a custom view. This option is not available in web editing mode, but can be accessed when you open a view to interact with it. A custom view does not change the original, but is related to it. If the original view is updated or republished, the custom view is also updated. You can also choose whether your custom views are visible to other users (public), or only to you (private). For more information about custom views and how to create them, see Use Custom Views.